Most headphone amplifiers offer only a single-ended or unbalanced stereo TRS plug connection because they have common ground output. Common ground output means the left and right channels' negative speaker terminals are simply connections to ground. A headphone's left and right stereo signal's positive connections are carried by two separate wires that are wrapped by the headphone cable shield. The left and right negative signals are combined in the headphone and travel down the headphone cable's metal shield to the amplifier's ground. The headphone cable's grounded shield not only acts as the stereo signal return path but also protects the stereo signal from radio frequency interference (RFI) noise. This type of headphone cable can be correctly referred to as single-ended or unbalanced. It's called unbalanced because the impedance between the three conductors (two wires and the shield) is unbalanced. It can be called single-ended because the return path is ground. A single-ended headphone cable does not have to be shielded. Three unshielded wires (L+ R+ and -) can also be used but this is very rare. The cable's grounded shield is used for both signal transmission and noise rejection. A balanced stereo headphone cable uses 4 wires of equal size, length and impedance to carry the stereo signal. It's called balanced because the impedance of the 4 wires is balanced. The 4 wires are for: Left +, Left -, Right + and Right -. A 4 wire balanced line rejects RFI and radio magnetic interference (RMI) naturally due to each stereo channel's two equal length and gauge wires both picking up the same electrical noise--one wire is positive and the other is negative so when the signal from the two wires is combined at the speaker the added noise cancels itself out. This is called CMR or Common Mode Rejection. Adding a grounded shield to a balanced line will offer even more noise reduction. For more information on balanced line theory and benefits see this wikipedia article. Four identical wires are used for signal transmission. The grounded cable shield is used only for noise protection. 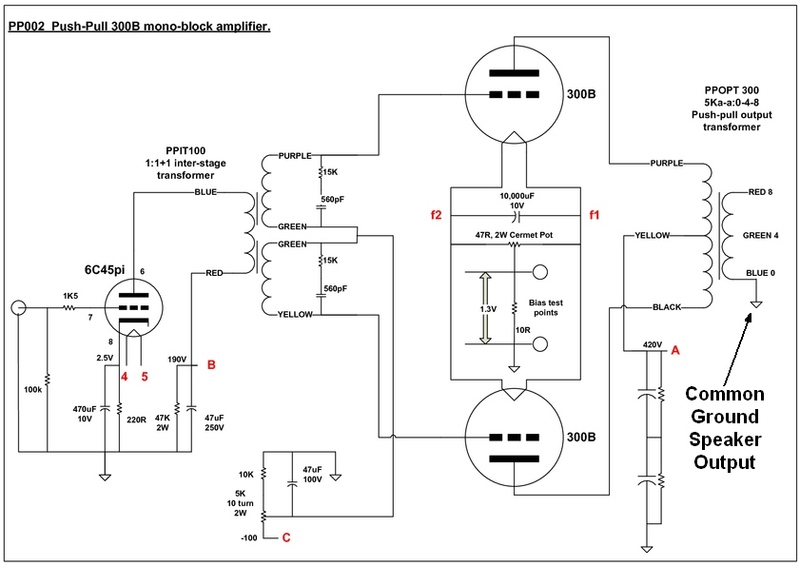 Push-pull amplifiers have two power tubes (or transistors) that work with mirror images of the input signal. One tube "pushes" to amplify the original signal (+) and the other tube "pulls" simultaneously with a reverse phase "mirror" image of the signal (-). Both "ends" of the signal are pushed and pulled into amplification ("double-ended amplification"). 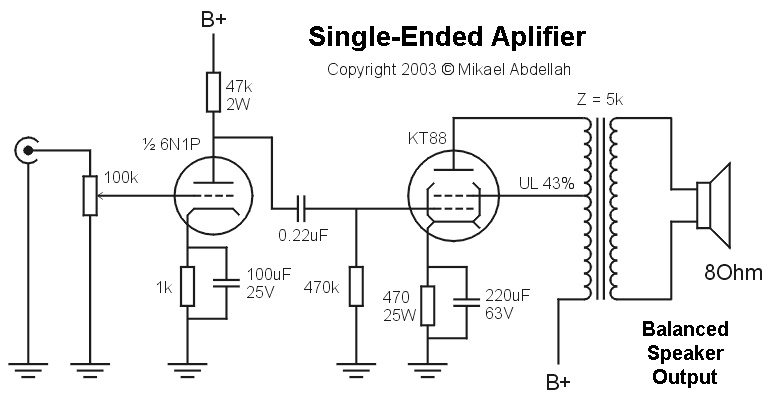 A single-ended amplifier has a single power tube (or transistor) that just "pushes" the original + signal for amplification. These types of amps normally use an internal common ground for the negative signal return path so they are "unbalanced." Unbalanced single-ended circuit -> transformer -> balanced transmission line -> transformer -> unbalanced single-ended circuit. What is a Fully Balanced Amp? 1. Balanced input meaning identical impedance in the positive and negative inputs (so common ground between the left and right channels cannot be used). Three-pin XLR connections are usually used for balanced input. 2. "Balanced amplification" meaning separate amplification of the left and right channels with no common ground in the amplifier's direct signal path (dual differential or dual push-pull amplification is normally used). I put "balanced amplification" in quotes because the term is not technically correct. 3. Balanced output meaning balanced (identical) impedance in the positive and negative transmission lines (so common ground cannot be used). The primary benefit of balanced output is to take advantage of common mode noise cancellation. Headphone balanced output is usually supplied by a single Female 4-Pin XLR or Dual 3-Pin XLR sockets. An amp can have unbalanced (single-ended, common ground) input with "balanced" push-pull amplification and supply balanced or single-ended output. Some amps have balanced input with single-ended amplification with internal common ground but supply balanced output. Two of these solid state transistor amps would be needed for stereo amplification. Note there is no grounding in the direct signal path from input through the amplifier stage and out to the speaker. The schematic below shows a single-ended amp with balanced output. The KT88 power tube is used to amplify only the + side of the signal path. The - signal path is simply ground. Even though this amp is single-ended the speaker side of the output transformer is not grounded so it gives balanced output and would offer matching impedance on the + and - speaker terminals so it would give common mode noise cancellation when used with balanced speaker wires or a balanced headphone cable. Balanced speaker wires need to be identical in size and length to ensure identical (balanced) impedance to benefit from common mode noise cancelation. 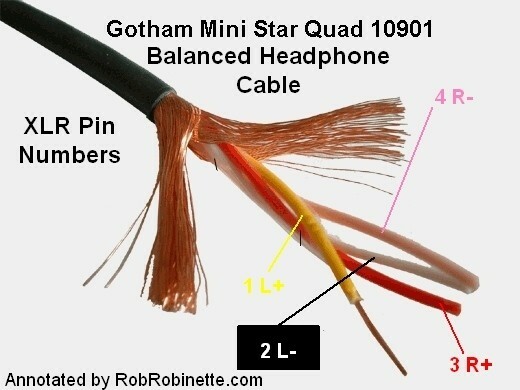 If you used a coax for speaker wire and wired the cable's center conductor to the + speaker terminal and the cable shield to the - speaker terminal you would lose common mode noise cancellation due to conductor impedance mismatch--the coax has unbalanced impedance. Note the input is unbalanced (negative terminal is grounded), the amplifier stage is single-ended (single KT88 power tube) and uses an internal common ground but the speaker side of the output transformer is not grounded and is therefore balanced. Note the input is unbalanced, the amplifier stage is "balanced" push-pull but the speaker half of the output transformer uses a common ground for the negative speaker terminal so the output is unbalanced. Even if you used impedance matched speaker wire you would not get common mode noise cancelation. Since this amp's speaker output has a common ground it is unbalanced so using balanced speaker wire would not give common mode noise cancellation. The term "single-ended" is currently used by the electronics industry and audiophiles to describe both amplifier circuits and unbalanced component and circuit interconnects, but only audiophiles use the term "fully balanced amplifier."